Geese, being creatures of habit, returned to the same spot the next year to again feast on his soybeans. But this time, the geese ate only from a specific part of this field. There, as a result of their feasting, the beans grew only ankle high. 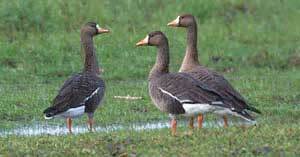 The geese, it seemed, were boycotting the other part of the same field where the beans were able to grow waist-high. The reason: this year, the farmer had tried the new, genetically engineered soybeans. And you can see exactly where they were planted, for there is a line right down the middle of his field with the natural beans on one side, and the genetically engineered soybeans, untouched by the geese, on the other. Visiting that Illinois farm, veteran agricultural writer C.F. Marley said, "I've never seen anything like it. What's amazing is that the field with Roundup Ready [genetically engineered] beans had been planted to conventional beans the previous year, and the geese ate them. This year, they won't go near that field." CHESTERFIELD, Mo.--For nine years, two dozen genetic engineers struggled to create a simple soybean that would stand up to a killer herbicide. (Aug. 15, 2001 – CropChoice news) – The following is a press release from Greenpeace International regarding a new study about possible problems with Monsanto's Roundup-resistant soybeans. The environmental group, Greenpeace, today sounded the alarm about new information published by a team of Belgian scientists in the European Journal of Food Research Technology. The peer reviewed study shows "unknown DNA" in genetically engineered (GE) "Roundup Ready" (RR) soybeans patented and sold by US multinational Monsanto (1). "The findings clearly establish that the GE soybean that has been approved based on Monsanto's own description of the genetic alterations is not identical to the GE soya sold by the company since 1996 world-wide," said Lindsay Keenan of Greenpeace International. "Monsanto have again been shown to not even know the basic genetic information about what is in their GE soya." Greenpeace demands immediate steps to be taken by the competent authorities in Europe and other countries, where the GMO has been approved based on the inaccurate submissions of Monsanto. The paper reports "…a DNA segment of 534 bp DNA for which no sequence homology could be detected ..."The scientists conclude that "…during integration of the insert DNA rearrangements or a large deletion may have occurred". This is the second time the team of researchers observed embarrassing inaccuracies in Monsanto's description of its best selling Genetically Modified Organism (GMO). (2). Greenpeace noted that it cannot be ruled out that the unknown DNA is of foreign origin, e.g. from another organism used in the genetic engineering process. In Europe, the UK Government Advisory Committee on Novel Food & Processes (ACNFP) was the authority who initially assessed Monsanto`s GE soybeans and suggested to approve its import into Europe. Hence the ACNFP is also the responsible authority in Europe for further action regarding this soy. In Jan. 2000, the Committee agreed there was still uncertainty regarding the origin of the DNA and asked Monsanto to provide data demonstrating that this DNA is "silent" and does not result in the production of a novel protein. "To ask the company who did not inform the relevant authorities about this DNA in the first place to now confirm it is not significant is certainly not what you would call a sound scientific approach," commented Keenan, "and it is certainly not what consumers would call appropriate measures to protect their safety." To date the ACNFP has not published (nor probably obtained) any further information regarding the origin and possible function of these 534 base pairs of unknown DNA. "At this point we expect the European Commission, who is responsible for the accurate and timely evaluation of any new scientific evidence about approved GMOs, to intervene and to immediately take precautionary measures," said Keenan. This is the first time a peer reviewed scientific journal publishes an independent scientific analysis of pivotal data submitted by a company for GMO approval. In most cases government authorities neither have the means nor the ambition to counter-check the accuracy of the GMO descriptions and rely entirely on the data submitted by the companies themselves. "If Monsanto did not even get this most basic information right, what should we then think about the validity of all their safety tests and experiments, which are based upon these data?" asked Keenan. In past years some "side effects" of RR soybeans have been observed but never explained conclusively. These include phytoestrogen levels different from the levels of natural soy, increased lignin content which made RR soya plants brittle in hot temperatures and reduced yields (4). As the size of the newly revealed "unknown DNA" would allow the sequence to code for a new protein or exert other functions within the DNA and because its origin and function appears to be unknown both to Monsanto and the competent authorities, Greenpeace published today the sequence on its web-site (http://www.greenpeace.org/~geneng/ and invites the international scientific community to help identify its nature and possible consequences. Characterisation of the Roundup Ready soybean insert, Peter Windels, Isabel Taverniers, Ann Depicker, Eric Van Bockstaele, Marc De Loose, (2001) Characterisation of the Roundup Ready soybean insert. European Food Research and Technology, v.213, issue 2, pp. 107-11 . The Belgian team had last year already discovered two formerly unknown DNA strains in Monsanto`s GE soya thereby forcing Monsanto to eventually reveal this information to EU authorities in May 2000. These two inserts were identified as fragments of the initial insert and presumed to be insignificant and non-coding. a single copy of the gene coding for glyphosate tolerance CP4 5 enolpyruvylshikimate-3-phosphate synthase (CP4 EPSPS) from Agrobacterium sp. strain CP4, and the chloroplast transit peptide (CTP) coding sequence from Petunia hybrida with the promoter P-E35S from cauliflower mosaic virus and the nopaline synthase gene terminator from Agrobacterium tumefaciens". Lappe, M.A., Bailey, E.B., Childress, C.C. & Setchell, K.D.R. (1998/1999), Alterations in Clinically Important Phytoestrogens in Genetically Modified, Herbicide-Tolerant Soybeans. Journal of Medicinal Food, 1, 241-245. Coghlan, A. (1999) Splitting headache. Monsanto's modified soya beans are cracking up in the heat. New Scientist, 20 Nov. 1999, p. 25.